Today's top news: What's trending in New York City? What's trending in your locale? Hoodline sifted through top local news to find this news you need. Today New Yorkers are reading about weather, transportation, and local politics. A quick moving front that shut government offices in Washington and grounded more than a thousand U.S. flights is expected to leave New York commuters slipping and sliding on the way home Wednesday. 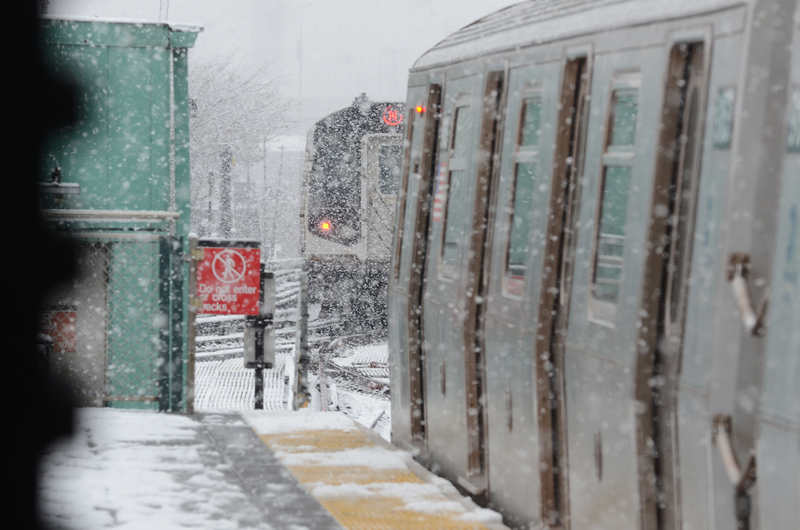 Snow began falling across Washington and New York and will leave as much as 4 inches (10 centimeters) before it changes to sleet, freezing rain and, finally, all rain, said Bryan Jackson, a forecaster with the U.S. Weather Prediction Center in College Park, Maryland. Charging motorists a fee to enter Manhattan south of 60th Street, and using the money to fund mass transit, is an idea "whose time has come," Governor Cuomo said two years ago. A man was dragged to his death by a New York subway train Tuesday evening, authorities said. The man was standing near the edge of the subway platform when the incoming train caught hold of an article of clothing and pulled him into the tunnel, a New York Police Department spokesman said. New York Times White House Correspondent Maggie Haberman said it was "a lie" when President Donald Trump claimed reporters do not reach out for comment in advance of publishing a story. The Times reported Trump called former Acting Attorney General Matt Whitaker to ask him if an attorney appointed by the president could un-recuse himself in an investigation by the Southern District of New York regarding 2016 payments. Trump responded by lambasting the publication during a Wednesday morning Twitter tirade. New York City has subpoenaed Airbnb for data on roughly 20,000 listings in the area to make sure hosts aren't breaking local laws about short-term rentals. In an interview on television station NY1 on Monday, New York City Mayor Bill de Blasio shared his rationale for the subpoena from the Office of Special Enforcement: "If your apartment was rented out every single day, it's not your apartment anymore. It's a business." Read the full story at CNN Business. After having a very New York City day complete with a trip to the Met Breuer museum and Laduree in Soho, Meghan Markle reunited with close friend Serena Williams for a very NYC dinner at Ralph Lauren's Polo Bar restaurant. Read the full story at The Cut. In a historic step towards long-overdue equality, targeting people based on their hair or hairstyle--an issue that disproportionately affects black men and women--will now be considered racial discrimination in New York City. Under new guidelines released by the New York City Commission on Human Rights, appearance and grooming policies that ban natural hairstyles--including locs, cornrows, braids, twists, Bantu knots, fades, and Afros--in public are illegal and punishable by law. Read the full story at Vogue. Stores and restaurants in several states would be required to do something pretty basic if certain lawmakers have their way: accept their customers' cash. The legislation comes amid a worldwide move toward "cashless payments" using cards or mobile devices, which supporters say are safer, quicker and more convenient. But critics say an outright ban on cash discriminates against those without credit or bank accounts, and raises concerns about privacy and data security.